Categories: Seasonal, Soup. 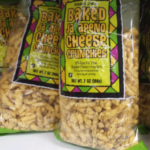 Tag: gluten-free. Not having enough broth from my Thanksgiving turkey, I used this broth to make my cornbread dressing and I couldn’t tell the difference. 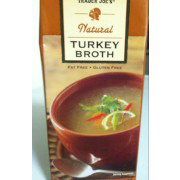 Turkey broth is difficult to find so I was happy to find this at TJ’s. I normally make my own stock but did not have time this year. Instead I added TJ’s turkey stock to my bones and veggies to make stock. DISASTER. Turkey stock had no smell in tetra container; I should have tasted it. Resulting stock from bones and veggies tastes like old socks. I made a separate batch with uncooked wings, giblets, and some lose bones with just water. Tasted Great, so it was definitely the TJ stock….